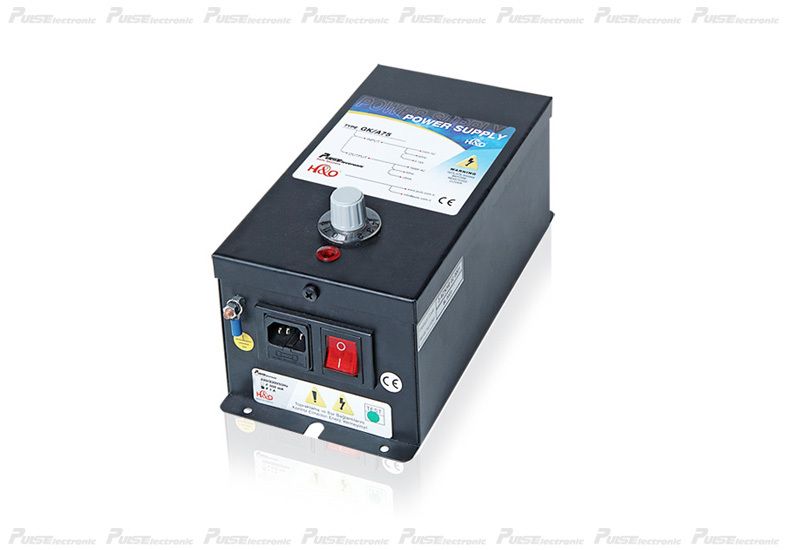 Puls GKA75 is a power unit working along with antistatic elimininators,neutralizing,ionizers and similar ionising equipment.Basically can be considered as power source necessary for active ionization equipment. Easy set up and operation, no need for additional maintenance. More than one antistatic eliminator can be operated so that the total length of the antistatic bars not exceeding 4 meters. There is a protection card on Puls Power Unit to provide system safety during active operation. This protection card cuts the circuit by ceasing further current to system in case high voltage cable connected to ionization equipment or ionizer is short circuited. In this case, the safety of the transformer inside the power unit as well as longer operation life is provided. Also in terms of the safety of mains additional protective measures such as galvanic isolation and magnetic curent limitation are available. Outer Body is manufactured of metal material and grounded, accordingly it does not generate electromagnetic emission. Antistatic ionizing air blowers, static eliminator bars, antistatic bars, all types of eliminators suitable to output voltage preventing static electricity such as eliminators, static bars, static eliminators, static ionizers, ionizing equipment, antistatic air guns. Coating/Lamination/Plastic Bag/ Sheet Drawing / Slicing/ winding/ Unwinding/ Stretch/ Folding Machinery/ Paper Mill/ Blowing/ Film Drawing/ Extrusion/ Flexo Printing/ Inkjet Printing/ Laser Printing/ ESA Printing Technology/ Styrofoam Lines/ Granule-Masterbatch lines, etc.